IMU Student Becomes Most Hated Guy on the Internet over His Trolled Comment on Celeb's Death Post. 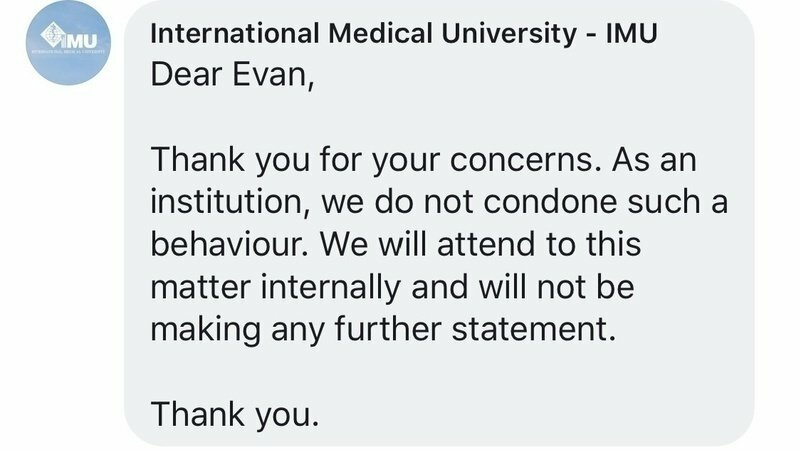 Over the weekend, we learned that what you type as a comment in Facebook have some serious consequences...like this idiotic IMU student, Kiren Raj, whose "humour" was not well-received by the public, over the death of Malaysian actress/singer Emily Kong. 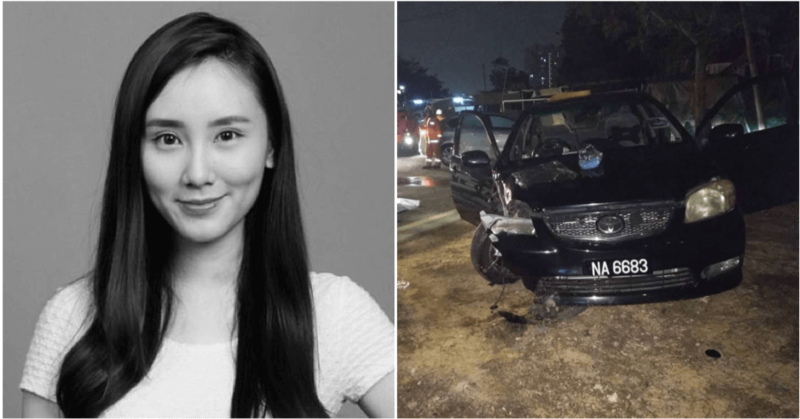 To put this news in order, Malaysian singer/actress Emily Kong was killed in a terrible car accident last Saturday at NSK Trade City Kuchai Lama @ 3.20AM. However, while many were mourning over the loss of a talented Malaysian, this thambii (studying to become a doctor btw...) decided to post a smart-aleck comment on a Facebook post stating that "women need men, and give s*x in return". When I read this, I was like... WADDAFARK DEII!! I'm the first to agree that sure both parties (men & women) love s*x but waddafark does it have to do with being an independant woman trying to get home safely on her own?! This comment is so disgusting that it has caused a huge riot against Kiren Raj. Oh man, now I get why people are getting a petitioned signed against him...and from what I hear, there are people actually looking to physically confront him. One netizen is so unpleased about this that he is personally trying to reach out to IMU to do something about this retard. 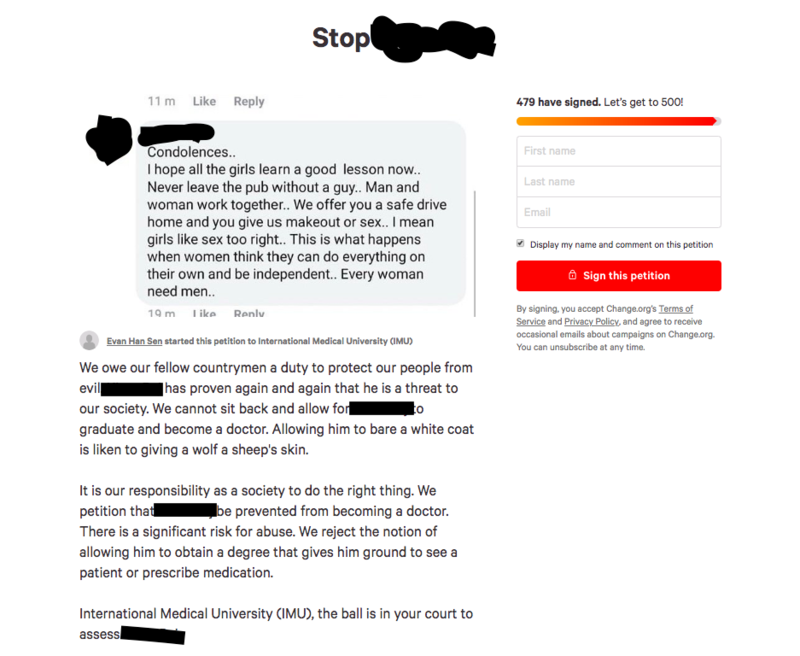 A petition has been going viral online to demand that Kiren Raj is stopped from being a doctor, and I would be the first to be happy to sign it as who would ever want a sexist-idiotic man being a doctor right?? If you feel strongly about putting Kiren Raj in his place, click HERE to sign the petition. Having said all that, we'd just like to give our condolences to all Family and Friends of Emily Kong over the loss in this tragic accident. No, not all men are neanderthals like Kiren here; a lot of us would love to help a woman get home safely WITHOUT asking for s*x in return. Rest in Peace Emily Kong, and may you provide more entertainment in Heaven. Susan Zuzartee What "be the bigger man"? You are not a man. You are SCUM. What kind of father wld bring up his son to become this! !